Gov. Larry Hogan, right, endorsed former delegate Ron George, center, for state Senate Tuesday, along with Senate Minority Leader J.B. Jennings, left. In the Republican “Drive for Five,” GOP leaders know that Legislative District 30, covering the Annapolis area and south, will be a key to getting more senators in the State House. The GOP’s goal is to win five more state Senate seats, bringing their number to the crucial 19 that would enable them to block overrides of Gov. Larry Hogan’s vetoes with the largest contingent of Republican lawmakers ever. That’s why Hogan on Tuesday gave his “100 percent enthusiastic endorsement” to former delegate Ron George, 64, at a fundraiser at Annapolis Yacht Club, a man who ran against Hogan in the Republican primary four years ago. But the governor, in what may have been campaign exaggeration to rev up the troops, held out the hope for an even more ambitious goal. District 30 is one of the few truly partisan swing districts in the state, long represented by the moderately conservative Democrat John Astle in the Senate and a mix of Republicans and Democrats in the House of Delegates, including Democratic Speaker Michael Busch. District 30 voters will have as clear a choice for state Senate as they do for governor between Hogan and progressive Democrat Ben Jealous in the fall. George faces Sarah Elfreth, 29, a progressive Democratic activist and lobbyist, who has already raised $125,000 and hopes to raise another $100,000 in the fall after fending off a primary challenge from the left by Chrissy Holt. Elfreth is running on a ticket with Speaker Busch and newcomer Alice Cain, seeking the delegate seat now held by retiring Republican Herb McMillan. Republican Seth Howard is seeking re-election to the single-member District 30B south of Annapolis along the Bay. George had no opposition in the fall and had $172,000 in campaign cash on hand in June. Sarah Elfreth from her campaign website. George and Elfreth are sharp contrasts in age, experience and ideology points emphasized by George on Tuesday. He is the long-time owner of a Main Street jewelry store with a strong online presence and represented much of the area for two terms in the House. He touted his record as an employer and involvement in the community. But while noting his ability to work with Democrats in the legislature, George also stressed his conservative credentials, such as support for anti-union right-to-work laws, school choice and his opposition to any tax hikes. He also criticized “my opponent,” saying she prepared for the job by getting a degree in political science and working as a lobbyist. But Elfreth has other credentials as well. While at Towson University, she served as a student member of the Board of Regents of the University System of Maryland, where she got to know Chancellor Brit Kirwan, who now chairs the education commission reworking funding formulas for public schools. “That is the issue for the next session,” Elfreth said. Her lobbying included work for the National Aquarium in Baltimore, helping it to acquire additional state and local funding. She was also president of the District 30 Democratic Club and a vice president of her community association in downtown Annapolis. In an interview, Elfreth said she has knocked on 8,000 doors and has heard a lot about school overcrowding and teacher salaries, and the loss of experienced Anne Arundel County teachers to Howard and Montgomery counties. Voters also talk a lot about the Chesapeake. “It’s why people live here,” Elfreth said, and it unites the people of Annapolis with those who live in the more rural south. In the legislature, she wants to fight for more forest conservation and stricter enforcement of critical area controls of the coastline, which she believes have become lax in the county administration. 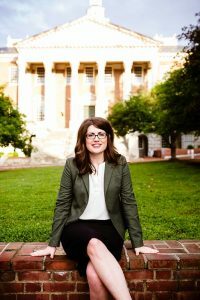 She sees her youth as “an asset,” bringing “fresh perspectives and new ideas” to the legislature. Elfreth called Jealous an “exciting candidate” with the ability to excite different audiences, and said he represented the shared values of the Democratic Party. But a key issue is “how to pay for everything we want to do in a reasonable way,” particularly the increased funding for schools the Kirwan Commission is expected to recommend. With most of the Maryland Senate safely in Democratic hands, and at least a dozen Republican seats considered safe as well, there are only five or six races where a seat is likely to turn over to the opposite party. Surprises in other districts are always possible. Besides the District 30 race between Ron George and Sarah Elfreth, there is the other open seat in Anne Arundel County in District 32 where Democrat Ed DeGrange is retiring. Democratic Del. Pam Beidle faces Republican County Councilmember John Grasso. Beidle has represented the district for four terms and on the county council before that. Grasso has not represented much of the district. In District 42 in Baltimore County, now represented by Democratic Sen. Jim Brochin, Republican Del. Chris West faces Democrat Robbie Leonard. The district leans Republican in voting except in the Towson area. In Frederick County’s District 3, incumbent Democrat Sen. Ron Young faces businessman Craig Giangrande. In the three counties of the Lower Eastern Shore, Republican Del. Mary Beth Carozza is taking on incumbent Sen. Jim Mathias, who currently has twice as much money on hand as she does, $244,000. In Baltimore County’s District 8, longtime Democratic Sen. Kathy Klausmeier, chair of the Senate Rules Committee, is being challenged by first-term Republican Del. Christian Miele. In Harford County’s District 34, first-term Republican Sen. Robert Cassilly is being challenged by long-time former Democratic Del. Mary-Dulany James.